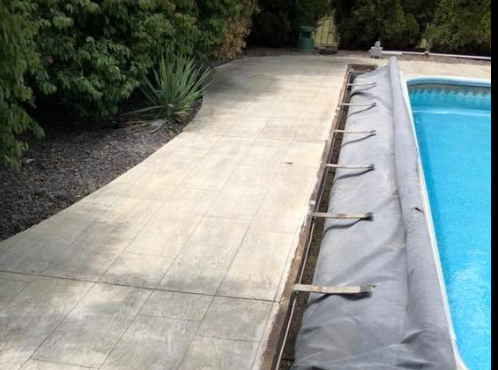 In the recent years stamped concrete has become a very popular choice for homeowners. 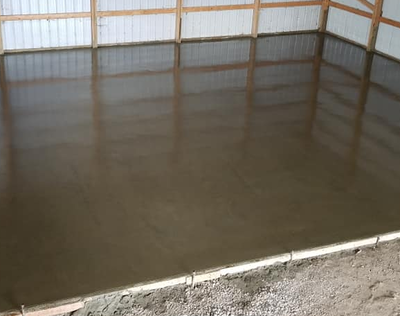 Here at Savannah Stamped Concrete we are skilled professionals when it comes to your any and all of your concrete needs. We provide multiple choices for different patterns, textures and color combinations, making your all of your concrete projects as unique and original as you are. 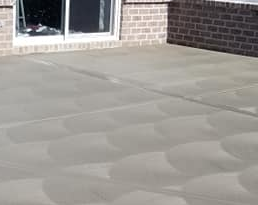 Since the process and techniques used to create stamped concrete patterns is tedious and requires a professional touch, it isn't a task that you would want to leave to just anyone. Our concrete contractors are ready to meet at your house to give you a free quote for any the hardscape ideas that you have in mind. We specialize in stamped concrete driveways, stamped concrete patios, stamped concrete pool decks and much more! Stamped and decorative concrete always makes a powerful impression on anyone who walks on it, which is why so many homeowners and business owners are opting to go with stamped concrete for their buildings, houses, and landscapes. 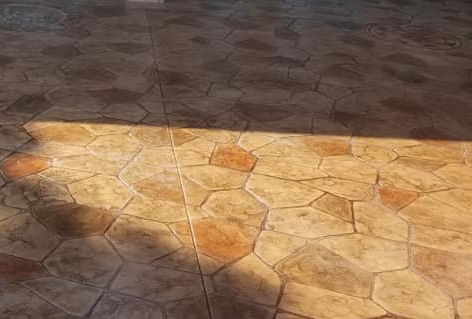 From a brick driveway to a tile interior floor, the look of decorative concrete is not only beautiful, but also holds the durability and strength of concrete. How do you know if stamped concrete is right for you? With a wide variety of color, pattern and textures, there is no way you can go wrong! You may have thought that your patio would be best suited with pavers or stone, but imagine having that same look, with a cheaper price and the longevity and strength of concrete. Most current concrete stamps are made from polyurethane and are created to form the natural stone texture. 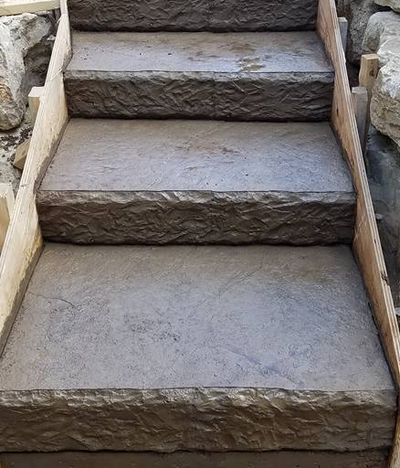 With our services you can create the look and feel of almost anything in nature including, shells, wood, fossils, and more! So why would you want to call us and get your projects done with stamped concrete? Low maintenance. When you have concrete instead of pavers or wood, you take away the chance of any weeds growing through or rotting boards to replace, thus removing the work of maintaining a clean and clear surface. 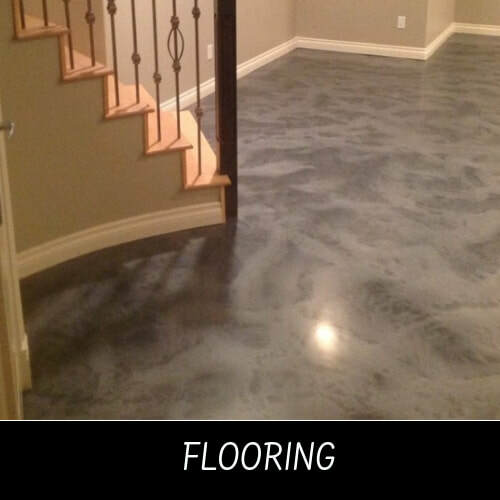 Why else is decorative concrete a wise choice? Solidity. When you know your driveway is solid with concrete, even if it has the look of a fragile stone, you will be worry-free knowing your drive is safe from extreme weather or heavy traffic. And as if those aren’t reasons enough to proceed with stamped concrete don’t forget about curb appeal! Your home’s value is guaranteed to go up. 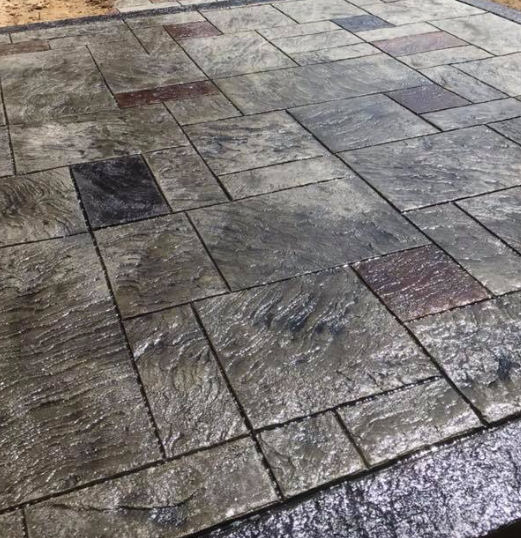 If you are thinking about selling your property you should add stamped concrete to give your home the added value that speaks for itself. Let our professional concrete contractors bring out the full value of your home or business! Concrete driveways can add a great look to your residential homes curb appeal. 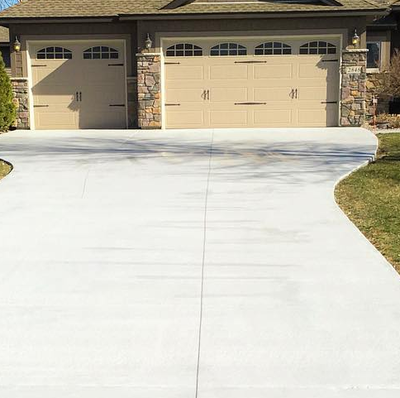 With the ability to color concrete we can match any home decor and turn that boring look of plain concrete into a head turning decorative stamped driveway that makes you the talk of the neighborhood. With an array of stamped designs, your home driveway will never be the same as it once was. When it comes to the durability of your driveway we do things right from the solid compacted foundation gravel, to the fiber mesh and rebar installation during the pouring process. We make sure all expansion joints are properly cut with our concrete cutting walk behind saw. 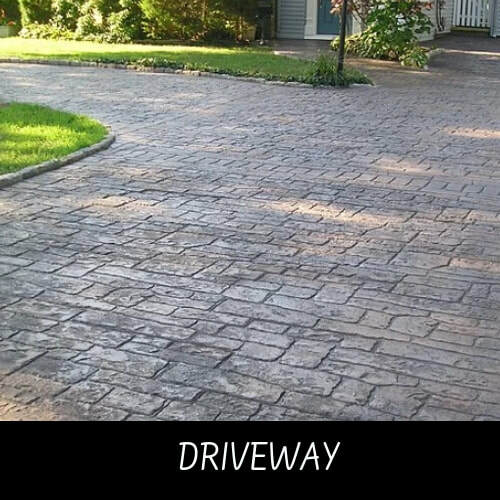 The difference between a gravel or dirt driveway and a brand new white, or stamped concrete driveway is unreal. It takes your house, no matter how lame the landscaping, to the next level. 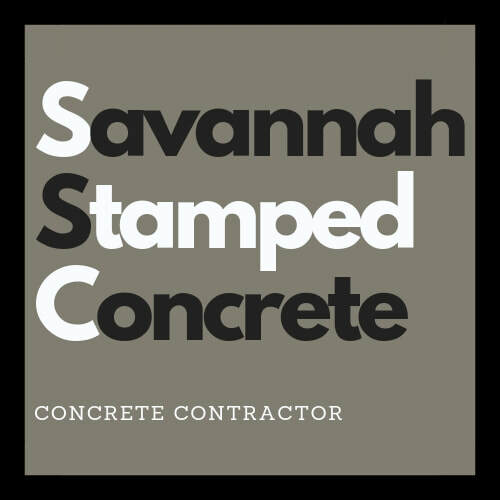 When it is time for you to get a new concrete driveway give Savannah Stamped Concrete a Call for a Free Estimate! Stamped concrete patios can turn your homes backyard into an entertainment area for your family and friends to enjoy for years to come. 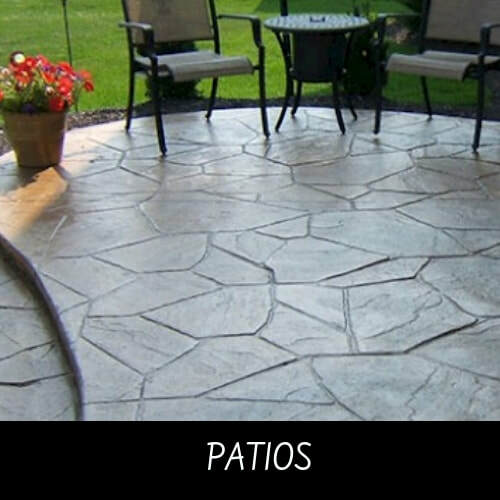 With an endless amount of concrete stamping options your patio will stand out from the rest. There are so many color and pattern combinations, you can make your patio completely unique, and completely your own. Concrete patios will last longer and be stronger than your wood deck options. Turn your lakeside waterfront home living area into an amazing outdoor BBQ area with a built in grill and concrete fireplace for summer enjoyment. 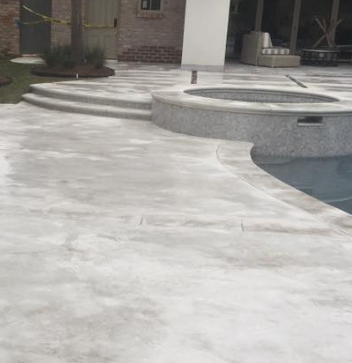 When it comes to stamped concrete cost you will pay more than plain white concrete, but its an artistic process and makes your outdoor living space custom to your home. Stamped patios, big or small, can make the difference in what kind of backyard you want to have. If you live in the Savannah area and you are looking for stamped patio ideas you have to call us to come out and go over some great designs for your next concrete patio projects. Call us for a Free Concrete Patio Quote. ​​A stamped concrete pool deck can bring your traditional pool into the new era of pool decks. We our changing the game of your backyard swimming pool landscaping with a custom stamped and stained pool surround. 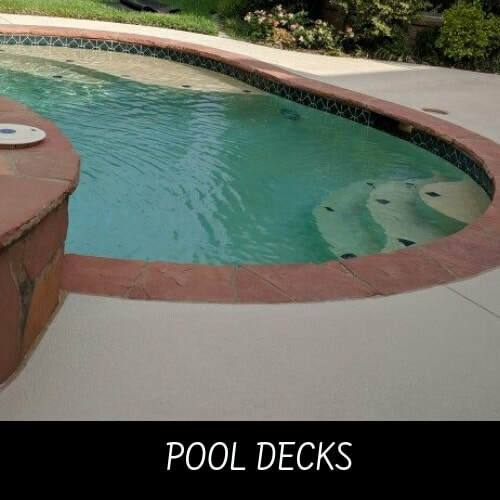 Let's turn your swimming deck into the talk of your town for years of enjoyment. We have many color options and decorative stamp designs. You can stamped your concrete pool deck to look like anything from wood, to brick, to stone, and beyond. 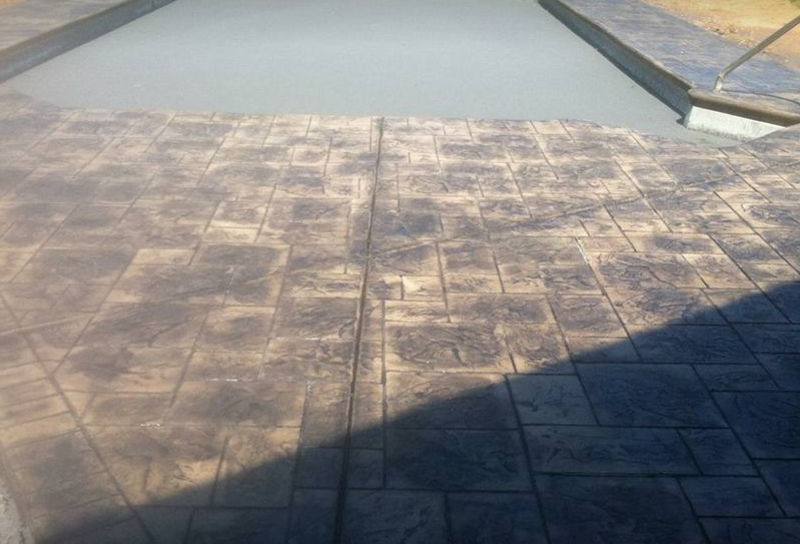 Savannah Stamped Concrete can add texture to your pool deck to prevent the slippery surface. We would enjoy the opportunity to meet you at your home or business to discuss the options and location of your next pool decking needs. Whether you have an exsisting pool that needs a fresh new look, or you're building a brand new pool and pool deck, we want to help. 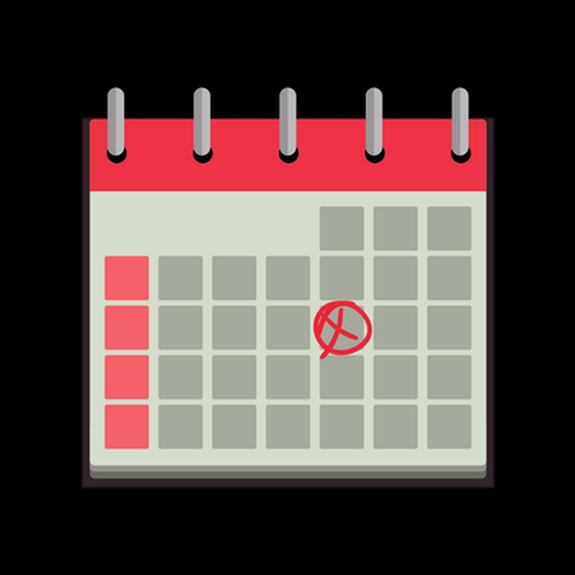 Reach out to us with a phone call or fill out the online forum today for more info.